Vegan chocolate mousse is perfect for dark chocolate lovers, who find themselves drawn to the bitter side of the spectrum. This is rather obvious, given that dairy milk and dairy chocolate are clearly missing from the equation. This recipe only requires 4 ingredients, 5 if you count the crust, and takes a matter of minutes from start to finish. No baking is actually required, and this is therefore the perfect recipe for when you need a fabulous dessert but you have no time to make one (but please note that the mousse must set in the fridge for at least an hour before serving). I made this vegan chocolate mousse for our kosher Thanksgiving dinner. Every single guest tried one, and every single guest finished it. My stepson declared the mousse one of the best parts of Thanksgiving. If you have guests that are tofu-phobic, you might want to refrain from mentioning the ingredients until after they devour it. For elegant presentation, do not put the mousse into the crust, but rather put the mousse into clear glasses (such as small wine or champagne glasses, as they typically do in restaurants). For beyond elegant presentation, put some berries on top. 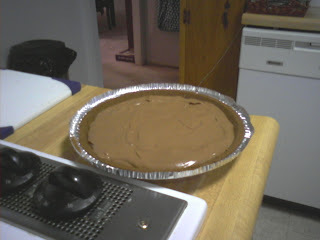 optional - for a chocolate mousse pie, I use a chocolate graham cracker crust. Berries can also be added on top of the pie or the mousse in cups. 1. Put the chocolate chips in a microwave-safe bowl, and heat for 1 minute, stir, and then heat for another minute (until melted). If you feel like doing this the slow way, melt via double broiler. 2. Put the tofu, milk, vanilla and melted chocolate into a blender or food processor, and watch as chocolate mousse is created in seconds right before your eyes. You may need to scrape chocolate from the side of the bowl and process some more. Process until entirely smooth (this should only take a minute, if that). 3. Pour the mousse into the crust, or put into individual cups, and place in the fridge for at least an hour.